As Christmas culinary activities were somewhat postponed for me, I’m finally getting round to making festive treats for friends and family. On a positive note, this is a good January, as the house is still full of nice ingredients and treats. You could say that the ‘Christmas Cupboard’ is well stocked. 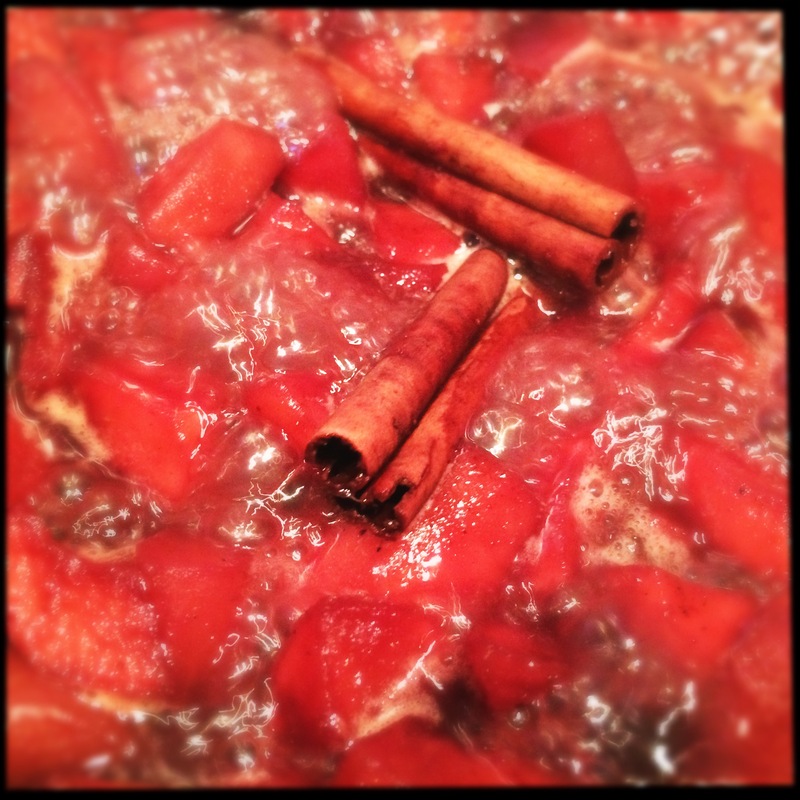 During my pre-Christmas planning which started back in, well, October probably, I came across the concept of making wine-based jellies to accompany cheese – much like the concept of Membrillo. 1. Lightly grease a 20x20cm tin with oil and line with cling film, leaving some excess to come over the sides. 2. Place the apples and pears in a heavy-based saucepan with the wine, orange juice, half of the lemon juice and the spices. Cook over a high heat for 30 minutes, until the fruit has broken down, the liquid has evaporated and you’re left with a dark red purée. 3. Push the mixture through a fine sieve, discarding any pulp. 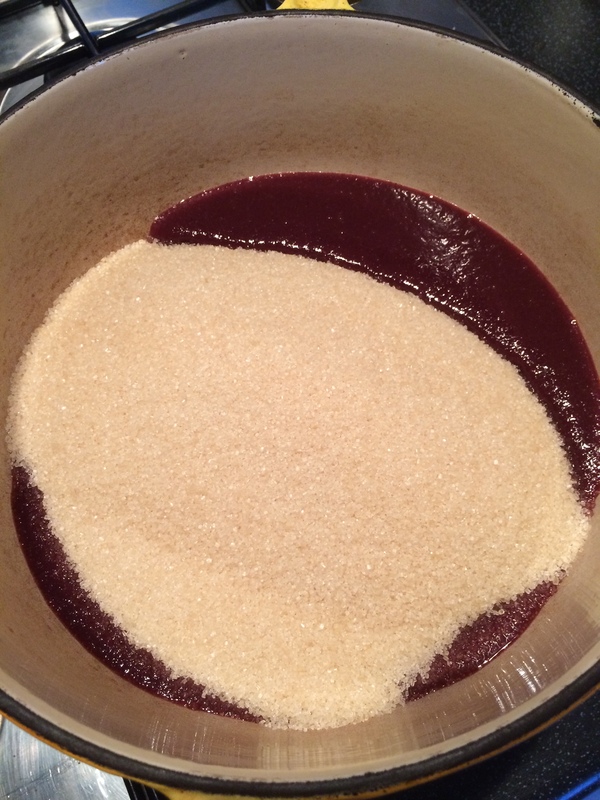 Pour the liquid back into the saucepan, add the golden granulated sugar and cook over a low heat, stirring frequently, until the sugar has completely dissolved. 4. Pop a sugar thermometer in the saucepan and let the mixture slowly cook for about 15 minutes, stirring often, until the mixture reaches 107°C. Then add the rest of the lemon juice along with the pectin and bring it up to 115°C. 5. You can check if your mixture is done by dropping ½ teaspoon of it into a bowl of cold water; if it forms a ball, it’s ready; if not, give it a few more minutes. 6. Pour into your prepared tin and set aside to cool. 7. Once cooled, cover the top of the mixture with cling film and leave to set at room temperature for at least 12 hours. 8. Pour the white caster sugar onto a tray. 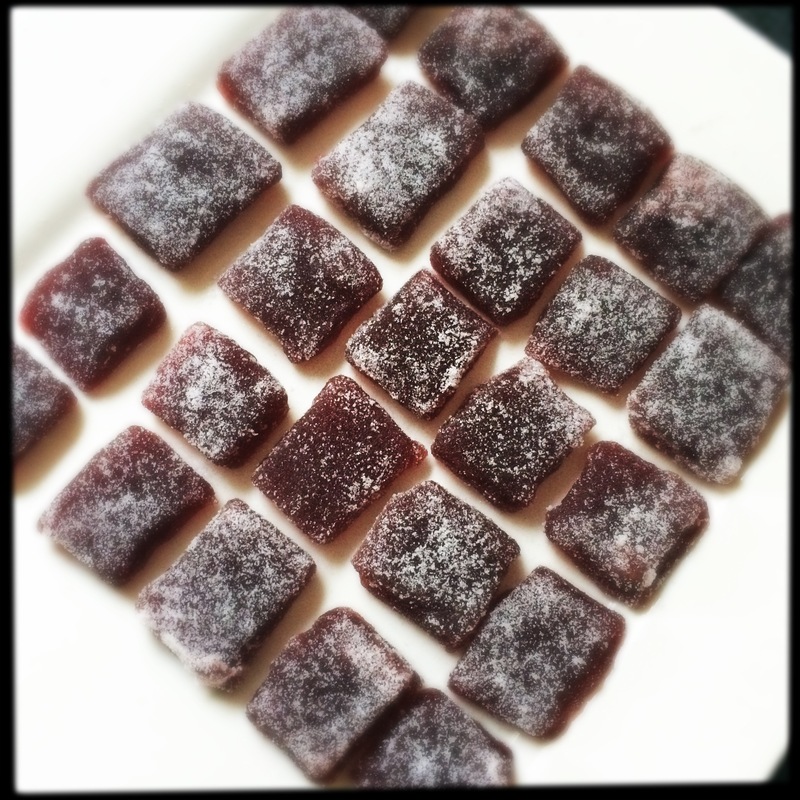 Using a hot or lightly greased knife, cut the set jelly into 2cm squares. Roll the jellies in the sugar and place them in the fridge until you’re ready to bag or box them up. Whilst making these, I recall thinking “never again”. In hindsight, I think that I will probably give them ago next year but pay more attention to testing how the mixture is setting. The flavour is fantastic, but the jelly can be terribly sticky and hard to work with if it isn’t quite set enough (hence the ‘rustic’ shapes).